These lamps are an original design by one of my assistants, Jim Parsons. 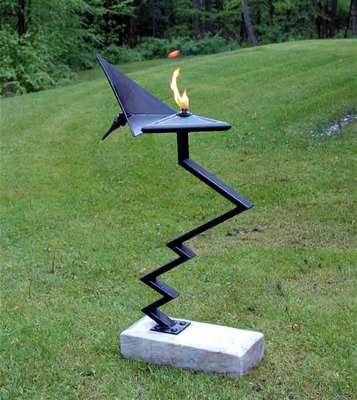 Jim is a talented glassblower, metalworker and woodworker, and also makes some mean Mojitos. Jim's original lamp went to a local Charles Moore (famous 60's and 70's modern architect ... i.e.Sea Ranch) designed contemporary house and this pair will be living in a stone garden next to a fantastic log cabin in the nearby mountains.